Black Friday and the official holiday shopping season is just around the corner, so the volume of deals has intensified and we're seeing many early opportunities as shown below, as well as preliminary announcements of the deals that will take place next week. As usual, the deal roundup below has been gathered by TechBargains and we're making sure only the best ones make it here. 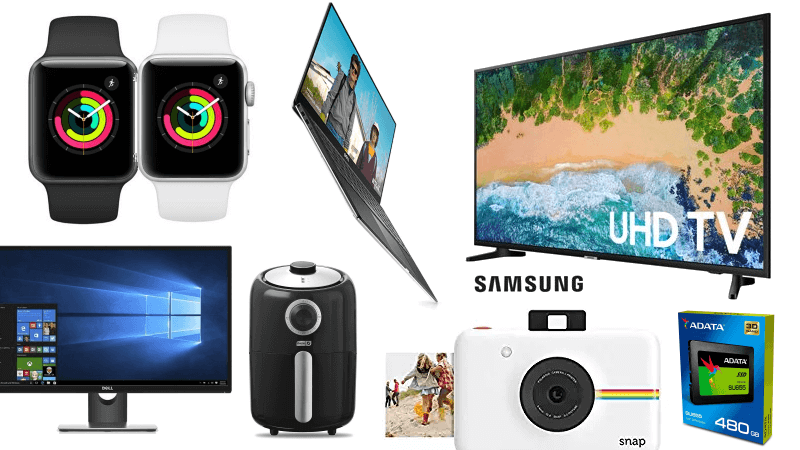 Today's highlights include a 50" Samsung 4K TV for just $328, while other larger screens are also receiving hefty discounts, 27% off Apple Watch Series 3 with a free band and Kindle Unlimited Memberships for $0.99. Dell Inspiron 3650 Intel Core i7-7700 Quad-core Win10 Pro Desktop with GTX 1050, 16GB RAM and Dual Storage for $699 at Dell (use code: BIZDT699 - list price $1109.99). Dell XPS 13 (9370) Intel Core i7-8550U Quad-Core 13.3" 1920x1080 Win10 Pro Laptop with 256GB SSD for $1112.49 at Dell (use code: SAVE11 - list price $1519.99). ADATA SU655 480GB 3D NAND 2.5" SATA III Solid State Drive for $64.99 at Amazon (list price $99.99). SkyTech ArchAngel Elite AMD Ryzen 2600 Gaming Desktop with GTX 1070 Ti, 500GB SSD for $899.99 at Walmart (list price $1099.99). Dell Inspiron 13 7000 AMD Ryzen 5 2500U 13.3" 1920x1080 2-in-1 Laptop with Radeon Vega8, 256GB SSD for $596.29 at Dell (use code: Eleven11 - list price $739.99). Dell Inspiron 5680 Intel Core i5-8400 6-core Gaming Desktop with 3GB GTX 1060 for $699.99 at Dell (use code: 50OFF699 - list price $869.99). Norton Security Premium Software (10-Keys/1yr, Digital Download) for $36.99 at Amazon (list price $89.99). 43" Vizio D43fx-F4 1080p Smart LED HDTV for $198 at Walmart (list price $278). 55" TCL 55S405 4K UHD HDR Roku Smart LED HDTV for $349.99 at Amazon (list price $599.99). 55" TCL 55S517 4K UHD Roku Smart LED HDTV for $429.99 at Walmart (list price $699.99). Out Tomorrow: Fallout 76 (PS4, Xbox One, PC) + $10 Credit for Amazon Prime Members for $59.99 at Amazon. Out Friday: Pokemon: Let's Go, Pikachu!/Let's Go, Eevee! (Switch) for $59.88 at Amazon. More TV Deals here. SanDisk SSD PLUS 480GB Solid State Drive for $74.99 at Amazon (list price $199.99). Crucial BX300 480GB 3D NAND SATA 2.5" Internal SSD for $79.99 at Amazon (list price $144.99). AMD Ryzen 5 1600 3.2GHz 6-Core Processor with Wraith Spire Cooler for $129.99 at Amazon (list price $189). Corsair Vengeance LPX 16GB (2x8GB) DDR4-3000MHz Desktop Memory for $119.99 at Amazon (list price $189.99). Jetstream AC3000 Tri-Band WiFi MU-MIMO Gaming Router for $99.99 at Walmart (list price $235). LG V30+ 128GB 6" Unlocked Smartphone for $429.99 at Amazon (list price $659.99). Prime Exclusive: LG G6+ 128GB Quad-Core 5.7" 2560x1440 Unlocked Smartphone for $399.99 at Amazon (list price $799.99). Prime Exclusive: Motorola Moto X 4th Gen 32GB 5.2" Unlocked 4G LTE Smartphone (Project Fi Compatible) for $199.99 at Amazon (list price $399.99). DJI Mavic Air Foldable 4K HDR Quadcopter Drone with Remote Controller, 32MP Sphere Panorama Shots for $699.99 at Amazon (list price $799). Logitech G933 Artemis Spectrum 7.1ch Wireless Gaming Headphones for $99.99 at Amazon (list price $199.99). Corsair M65 Pro 12,000 DPI Aluminum RGB Gaming Mouse for $29.99 at Amazon (list price $59.99). 3 Month Audible Gold Membership (New or Returning Users Only) for $6.95/month at Amazon (list price $14.95/month). Philips Hue White and Color Ambiance A19 60W LED Smart Starter Kit (2x Light Bulbs, Bridge) for $99.99 at Amazon (list price $149.99). Chamberlain MYQ Smart WiFi Garage Door Opener with Smartphone Control for $59.99 at Amazon (list price $79.99). AmazonBasics 0.5 cu ft Biometric Fingerprint Safe for $69.99 at Amazon (list price $99.99). Stanley SHP2150 2150 PSI Electric Pressure Washer with Foam Cannon for $134.87 at Walmart (list price $218.98). Stanley Black Chrome Laser Etched 99-Piece Socket Set for $67.99 at Walmart (list price $97.99).